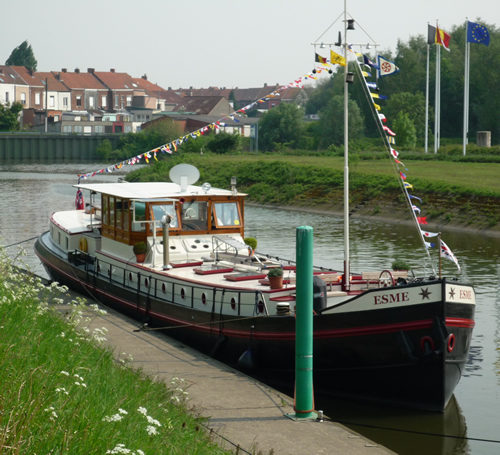 Chris and Diana Grant have been living their dream – enjoying adventures on the classic Dutch Barge Esme. After twelve wonderful years cruising the UK and continental waterways, the owners Diana and Chris Grant have decided to move on to new adventures. See the full details here. It all started in the summer of 2004. We were enjoying another holiday on board our 11 metre boat on the River Great Ouse in Cambridgeshire. The question arose "Wouldn’t it be great to live on board all the time? We could travel abroad and explore other waterways . . . . . . yes, then we could take our home with us!" So what kind of vessel would we need? A narrow boat would be a bit small to live on all the time (especially if you are tall!) It would have to be comfortable for year round living and able to go to sea. So the seeds of our Dutch Barge life were sown. We joined the Barge Association and started our research, meeting many bargees who received us on board and answered our endless questions. In this way we were welcomed into the world of barges. The advice, support and friendship we gained was invaluable and helped us to make the right decisions. By the summer of 2006 the children were independent, we had sold our family home and the search for our barge could begin. We met Ruud Thomas, a Dutchman who arranged a three day barge viewing tour of Holland and we found Esme up in North Holland. We loved her from the start, the price was right and a few weeks later were relieved that the survey report was good. As it was mid winter, it took a while to get her over to England. Firstly the repainting of the hull, then some essential work to prepare her for sea and finally to bring her to Nieuwpoort in Belgium for the channel crossing. And so our new life began . . . . . . . . . Please send us your comments and messages via our contact page, we would love to hear from you.